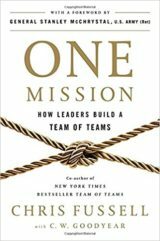 This book is a prescription for using the “Team of Teams” approach to tear down silos, improve collaboration, and avoid turf wars. Team of Teams was a predecessor book to One Mission, written by General Stanley McChrystal, that outlined many of the concepts on which Fussell elaborates, and for which Fussell develops prescriptions, in One Mission. One Mission looks at what is changing in the flatter, faster, less predictable world around us – globalization, the increasing pace of technological innovation, demographic shifts. He dives into dominant, traditional management and organization structure models – from Max Weber’s theories of bureaucracy to Frederick Taylor’s scientific management theory to Peter Drucker’s management by objectives, all of which have in varying degrees come under fire in recent years for taking the soul out of organizations. Short of advocating for throwing Weber, Taylor, and Drucker out with the bathwater, Fussell stops to ask what is useful about the application of their theories in contemporary organizations, and what might have been useful about them for a time but no longer applies. He also takes a look at emerging models, asking why some organic, highly-networked initiatives succeed and others fail. To guide us, David shares four key concepts that allow us to acknowledge uncomfortable experiences while simultaneously detaching from them, thereby allowing us to embrace our core values and adjust our actions so they can move us where we truly want to go. A must read for HR & business professionals! This book brings out an abundance of creativity, courage and attention to core values. In this collection of poetry, Fateme Banishoeib articulates in the most simplistic terms what a cultural misfit can do to an employee, to a woman, to a human. She holds a mirror up to us, as minority groups, as professionals and as world leaders; trying to make a case that we are all responsible for driving equity, inclusion and sustainability – individually and collectively. A great read for poetry loving leaders and individuals. In this book, Dr. Doty, a neurosurgeon, and founder of c-care at Stanford, shares his own vulnerability while restating very clearly the power (magic) we held in ourselves as human beings. If you are in search of better balance, harmony, compassion, love or in positions of power, we highly recommend this book as a self-development tool. The book Option B is dedicated to help others build resilience in the face of adversity. Together with Adam Grant, Sandberg shares stories, research, and practical advice to help all of us build strength for life’s challenges. In his new book, Adam Grant addresses the challenge of improving the world around us, but this time from the perspective of becoming a trailblazer: choosing to go against the grain, battle conformity, and buck outdated traditions. How can we stand up for new ideas, policies, and practices without risking our reputations, relationships, and careers? Using surprising studies and stories spanning the worlds of business, politics, sports, and entertainment, Grant debunks the common belief that successful nonconformists are born leaders who boldly embrace risk. Originals explains how anyone can spot opportunities for change, recognize a good idea, overcome anxiety and ambivalence, and make suggestions without being silenced. Brene Brown, a world recognized researcher on vulnerability brings about new and eye opening perspectives around how to face uncertainty, risk and emotional exposure. For first time people managers, entrepreneurs and really anyone, this book is a wonderful self-taught kit. In this wonderful book, Dr. Susan David talks about what separates people who are able to master life’s challenges and step up to leadership roles from those who are overwhelmed in the face of the same obstacles. 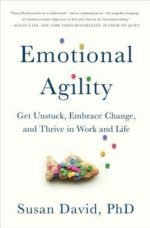 She explains with very clear examples how to build agility and resilience around emotional awareness and intelligence. Harvard Business School professor Amy Cuddy has been studying first impressions alongside fellow psychologists Susan Fiske and Peter Glick for more than 15 years, and discovered patterns in these interactions. Determining a company’s WHY is crucial, but only the beginning. The next step is how do you get people on board with your WHY? How do you inspire deep trust and commitment to the company and one another? He cites the Marine Corps for having found a way to build a culture in which men and women are willing to risk their lives, because they know others would do the same for them. It’s not brainwashing; it’s actually based on the biology of how and when people are naturally at their best. If businesses could adopt this supportive mentality, employees would be more motivated to take bigger risks, because they’d know their colleagues and company would back them up, no matter what. Drawing on powerful and inspiring stories, Sinek shows how to sustain an organization’s WHY while continually adding people to the mix. What do high performing teams have in common? At the core of Smarter Faster Better are eight key concepts—from motivation and goal setting to focus and decision making—that explain why some people and companies get so much done. Drawing on the latest findings in neuroscience, psychology, and behavioral economics—as well as the experiences of CEOs, educational reformers, four-star generals, etc. the book explains that the most productive people, companies, and organizations don’t merely act differently. They view the world and make choices in a very different way. The marketing as we know it is dead. It doesn’t matter if you’re pitching for a new job, filling seats at a benefit or selling an amazing new product, the world is too cluttered for your message without spending millions on advertising. The changing times has abandoned self-promotion and hype for an others-centered approach. In today’s economy, marketing starts with helping. There is no better way to grow, no better way to cut through the hot mess, no better way to reach your audience than to help them. In his book, Famously Helpful, Justin Blaney is providing practical insights that show you step by step how to become famous for your helpfulness. The book shares inspiration for how helpfulness will improve your business, nonprofit and career and helps boost your confidence to trade self-promotion, hype and ineffective marketing for an others-centered approach that will cut through the clutter of today’s over-spammed world. This book addresses the rise of the corporate chief of staff, a role that top and emerging leaders are using more often to manage the complexities of technological change, globalization, policy and regulation; to get out from under day-to-day, operational details and focus on the highest and best use of their time; to make and execute better decisions; and to provide an innovative leadership development and retention tool for high-potential employees. If you are on the need for a chief of staff, want to learn how to hire for the role, and/or how to make individuals in the position successful in the first 90 to 100 days and beyond, you should read this book or join the community at https://chiefofstaff.expert. In their new book, Agile Talent (Harvard, 2016), Dr. Jonathan Younger and Dr. Norm Smallwood describe how public and private sector organizations have increased their reliance on external talent. This is a global trend that is growing and unmistakable, and has important implications for organizations. Advisors, contractors, and gigsters play an increasingly crucial role in the work of corporations, governments and not for profit agencies; yet, too often, leaders lack an understanding of how their organizations can maximize the productivity, engagement, and satisfaction of these externals. The book defines agile talent as more than an additional source of expertise, but as a key stakeholder for organizations. As such, the Agile Talent is looking to facilitate greater understanding of how leading organizations relate to and partner with agile talent. This book speaks to the new generation of Human Resources professionals, explaining about the evolution, challenges, and innovations of our function, while putting a focus on things that limit the impact of our HR/OD practices. High performing HR executives are known to focus on their business vs. human resources departments. The book demonstrates this by providing examples and summarizes six competencies required for any HR professional to be successful going forward. This book synthesizes and summarizes the lessons we have learned about HR transformation. We have learned these lessons not in isolation but by working with thoughtful and innovative HR executives who have helped their organizations and the HR profession make meaningful progress in contributing to the performance of their companies. We have learned these lessons both from successes, where the transformation delivered value, and from failures, where we did not make the progress we intended. We hope this book captures both the theory (ideas, rationale, and approaches) and the practices (tools, processes, and actions) for creating a successful HR transformation. As a gift to each of you and a sign of our commitment to the profession, we are delighted to attach the book The Rise of HR in PDF form. This remarkable and one-of-a-kind book combines perspectives about how HR can “add value,” from a cross section of 73 global thought leaders. It lays out a positive and aspirational view of HR’s future, including: Insights on HR’s role in impacting business strategy through outside-in thinking; sourcing and optimizing talent; creating winning organization capabilities and cultures; using analytics and information for improved rigor in business decision-making; reframing HR governance; and defining future HR competencies. Each essay offers ideas with impact; collectively these ideas will shape our profession by helping HR professionals deliver additional value. You can also access it on this web site: www.riseofhr.com. What’s more, The Rise of HR models how HR professionals can promote innovative ideas through global collaboration. We appreciate the incredible work by the HRCI staff to create such a high quality book.